Hal Blaine, a member of the legendary Los Angeles group of session musicians The Wrecking Crew, has died at the age of 90. 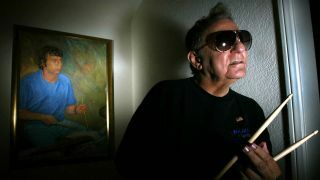 The news was confirmed in a post by his family on Facebook, which read, "Hal Blaine - loving father of Michelle Blaine; grandfather of Anthony, Josh, Aaron, Whitney, Tempest, Ever and Lyryk; and inspiration to countless friends, fans and musicians - has passed on today, March 11th, 2019 at the age of 90. "May he rest forever on 2 and 4. The family appreciates your outpouring of support and prayers that have been extended to Hal from around the world, and respectfully request privacy in this time of great mourning. No further details will be released at this time." On Twitter, Brian Wilson wrote, "I’m so sad, I don’t know what to say. Hal Blaine was such a great musician and friend that I can’t put it into words. Hal taught me a lot, and he had so much to do with our success - he was the greatest drummer ever. We also laughed an awful lot. Love, Brian"
Singer Nancy Sinatra uploaded a tribute video featuring her song Drummer Man, a 1969 single that featured Blaine. Blaine was born in Holyoke, Massachusetts, in 1929, and moved with his family to California as a teenager, where he learned to play drums. In the late 1950s he joined what later became known as The Wrecking Crew, an informal collective of Los Angeles session musicians that also included drummer Earl Palmer, saxophonist Steve Douglas, guitarists Tommy Tedesco and Glen Campbell, bassist Carole Kaye and keyboardist Larry Knetchel. Blaine played on over 100 top ten singles, and on 40 number ones, including sessions for The Beach Boys (he played on both Pet Sounds and Good Vibrations), and on Simon & Garfunkel's Bridge Over Troubled Water. “The image I got when I heard the song was a black man in a chain gang," Blaine said about the song. "So I went out to my car, got my chains from my snow tyres, and overdubbed the ending section. I was on my knees in front of the snare, pulling the tyre chains across the head, and slapping them down on two and four. It created a cool after-beat." Blaine also played on songs by The Byrds, Dean Martin, Frank Sinatra, Barry McGuire, Petula Clarke, The Mamas And The Papas, America, Johnny Rivers, the Association, Sonny and Cher, the Grass Roots and Gary Lewis and the Playboys. He estimated that he'd performed on 35,000 recorded tracks over the course of his career. Blaine published his memoir, Hal Blaine and the Wrecking Crew, in 1990, and was inducted into the Rock And Roll Hall Of Fame in 1990.